Do you want to improve the efficiency with miter saw blades? You are come to the right place. We are suggesting you a few tips for using power saw and achieve clean cuts for a masterpiece. According to The best Miter saw reviews, most of these devices come with a general 24-40 tooth blade. This is great for cutting framing lumber or deck as these don’t need clean cuts. But when it comes to crisp cuts in hardwood, you will need a better blade that has a low degree hook angle. So upgrade to a 80 tooth blade for a 10 inch miter saw, and 100 tooth blade for a 12 inch model. Blades with positive hook angle more than 10 degree attack the wood with aggressive cut. The negative hook blades ease in wood with shaving cut. You need a blade between 10 degree, and -5 degree. Even if your miter saw has zero clearance throat insert plate, it will soon overlap bevel and miter cuts erode that close to support. Most devices use a 1/8 inch or thin plastic inserts, this makes it impossible to make your inserts from plywood or MDF. Install a quick auxiliary table, and plywood fence. This way, you will have instance zero clearance to support and keep tears out of blade cuts. You may have to tweak the settings. 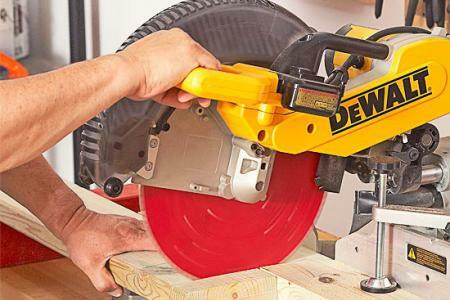 According to The best Miter saw reviews, you have to stop before lifting. After you have made your cut, you better allow the blade stop spinning before you lift the saw. If you raise it before, this can score the end of your masterpiece. The spinning blade may also snag cutoff and propel it at high speed, ruining the final product along the way.